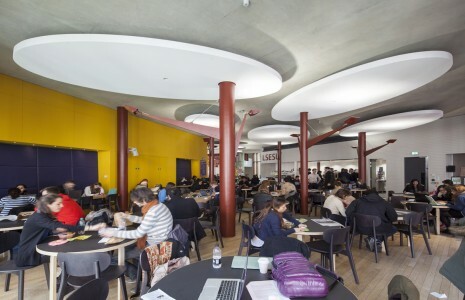 A new student centre at the London School of Economics relies on Sto acoustic solutions to attenuate echo and create better speech intelligibility for its vibrant student community. 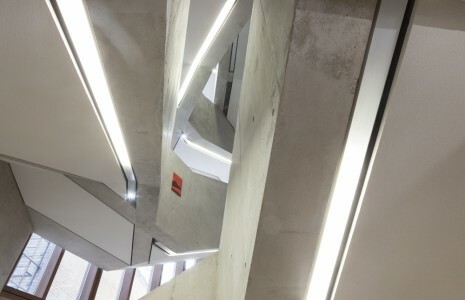 The Saw Swee Hock building, which opened its doors late last year, has an exposed structure that combines steel columns and trusses with concrete ceilings, glass walls, solid wooden floors and angular stairwells. Without soft furnishings to absorb sound, the reverberations would impact speech intelligibility. Irish architects O’Donnell + Tuomey worked closely with acoustic consultants Arup Acoustics to specify Sto. 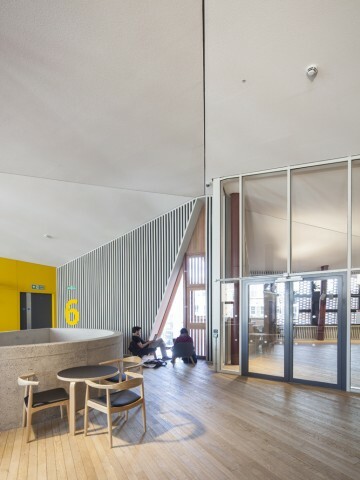 Willie Carey explained: “We were working to a dense and complex acoustic brief where aesthetics were paramount and Sto delivered to all of these requirements, achieving optimum acoustic performance and a seamless finish. 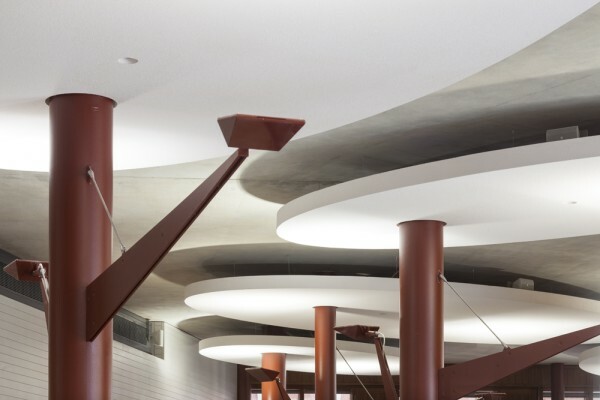 Sto acoustic products are installed in all seven floors above ground level and the two below. Bespoke StoSilent Panel acoustic clouds sprayed with StoSilent Superfine acoustically transparent plaster are suspended from the ceilings to absorb localised sound in the canteen. 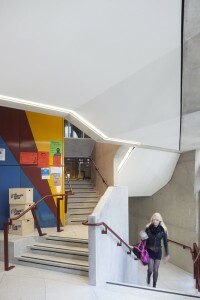 The flexibility of the system is demonstrated here with the boards curved in situ to form a very tight radius. Favoured by architects as it can accommodate ambitious designs, StoSilent Panel forms the ceiling in many rooms. This includes the basement nightclub where the ceilings were sprayed jet black and follow the angular geometries to create a seamless acoustic ceiling. The StoSilent Panel acoustic system features a high performance, suspended, recycled glass acoustic board for high acoustic performance. 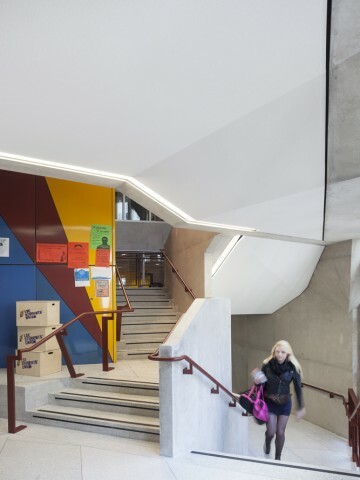 The unique expansion properties of the acoustic panel allow it to be installed in areas of up to 200 m² without the need for expansion joints. 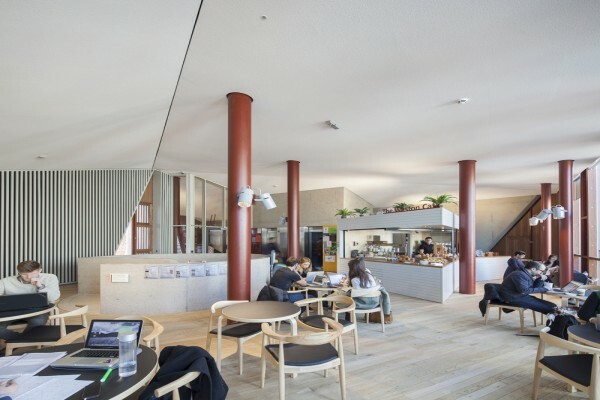 The unconventional shape of the multi-faceted brick structure is guided by the tangled streets it sits between and is said to have the feel of a lived-in warehouse. It comprises a series of conference rooms, entertainment spaces, a café, bar, a basement night club, multi-faith prayer rooms and a gym. It is named after Professor Saw Swee Hock who funded the project and celebrated the 50th anniversary of his graduation from LSE last year.